Agriculture Minister Somireddy Chandramohan Reddy has claimed that the Andhra Pradesh government is implementing the crop loan redemption scheme despite facing revenue deficit. 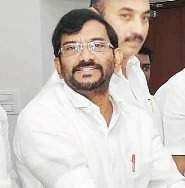 VIJAYAWADA: Agriculture Minister Somireddy Chandramohan Reddy has claimed that the Andhra Pradesh government is implementing the crop loan redemption scheme despite facing revenue deficit. “Though having a surplus budget, the Telangana government has waived crop loans only upto Rs 1 lakh. But, the AP government, despite facing many problems, is providing upto Rs 1.50 lakh loan relief to farmers,” he said. Drawing comparison with Uttar Pradesh, he said that the BJP government has announced loan waiver to a tune of `30,000 crore in Uttar Pradesh, which has a population of 22 crore whereas the TDP government is spending `24,000 crore towards crop loan redemption scheme in AP, which has a population of 5 crore. He said that without waiting for the aid from the Centre, the State government has announced to give `1,500 per quintal to chilli growers to ensure that the farmers will get at least `8,000 per quintal. Each chilli farmer will get a financial support up to 20 quintals and they can get upto `30,000, he said. Speaking to mediapersons at the Interim Government Complex at Velagapudi on Tuesday, Reddy said that the government would continue the scheme until the end of June. Funds to the tune of `300 crore were earmarked for the purpose. Stating that the government fixed a target to produce of 174 metric tonnes of foodgrains this year, he said an action plan has been prepared for achieving the purpose. The government has made available 4.30 lakh quintals of seed against the requirement of 9.68 lakh quintals.